Breathing Rhythm For Runners | Run S.M.A.R.T. It is of interest to understand what you are trying to accomplish when you breathe, and that is simply to ventilate your lungs. The total amount of air that you move in and out of your lungs per minute of exercise is referred to as minute volume, and is typically expressed as Ve (volume of expired air that you measure in one minute of time). Ve is the product of breathing rate, or frequency (f) and the average size of each breath, which is referred to as “mean tidal volume.” Therefore, Ve = f X mean tidal volume. If, for example f = 30 and mean tidal volume = 3.0 liters, this means Ve = 90 liters of air being moved in and out of the lungs per minute. Usually when f increases, then tidal volume decreases some, because the faster rate doesn’t allow enough time for the breaths to be as deep. What you are usually trying to achieve is to move a good amount of air in and out of the lungs, with as little wasted effort as possible, and a rhythm of 2-2 seems to do a good job of this for many runners. I want to make it clear that I am not trying to convince anyone to start counting their breathing rhythm every time they go out for a run, but it can be useful to have an understanding of what is going on in this regard. To make yourself more aware of the differences in breathing rhythms, try this sometime – run 5 continuous laps of a 400-meter track, at a comfortable pace. During the first lab, breathe with a 4-4 rhythm (4 steps while breathing in and 4 while breathing out). As you start the second lap, switch to a 3-3 rhythm; then 2-2 for the third lap; 1-1 for lap 4 (breathe in as 1 foot strikes the ground and breathe out as the other foot strikes the ground), and back to 4-4 for the 5th and final lap. Then ask yourself which felt best and which felt worst. In most cases, lap 1 was pretty comfortable, lap 2, good and lap 3 even better, but lap 4 quite annoying and lap 5 maybe not possible. Lap 5 allows you to compare a 4-4 rhythm with itself under different conditions – first when fully rested and just starting to run and again after having run awhile and feeling the need to better ventilate the lungs. From the explanation of how minute volume is arrived at, it may be of interest to consider some different combinations of frequency and tidal volume. For simplification, let’s assume you are taking 180 steps per minute. This means with a 3-3 rhythm you will take 30 breaths per minute (180/6 steps per breathing cycle = 30). With a 2-2 rhythm it becomes 180/4 = 45 breaths per minute, and if you were to breathe 1-1, then you would be taking 90 breaths per minute. An average-sized male runner, while running comfortably hard, might have a 2.5-liter mean tidal volume when breathing 3-3, and if so, then Ve would be 30 X 2.5 or 75 liters per minute. Increasing tidal volume to 3.0-liter breaths would make the Ve 90 liters/minute. If that isn’t feeling good, then a switch to 2-2 rhythm might drop the tidal volume a little (say back to 2.5) and 2.5 X 45 = 112.5 liters for minute volume. When the intensity of running increases, an even greater ventilation may feel more comfortable as the concentration of carbon dioxide in the lungs would be reduced somewhat. For example, sticking with a 2-2 rhythm and increasing tidal volume to 3.0 would increase minute volume to 135 liters per minute. Going to a 1-1 breathing rhythm would increase the frequency of breathing to 90 breaths per minute, but that rapid ventilation rate would also reduce tidal volume considerable, probably to less than 2 liters per breath, and even though Ve may be greater than the 135 liters achieved with the 2-2 rhythm, a larger portion of the air moving in and out of the lungs would not be useful air. Each breath would involve moving the (dead-space) air in the air passage ways from the mouth and nose leading to the lungs, back and forth 90 times a minute, reducing the useful air that is ventilating the lungs by a considerable amount. In addition, 1-1 breathing can be more costly to the ventilatory muscles which are now contracting 90 times each minute. Female runners tend to use the same breathing frequencies as do male runners, but since they are smaller and have smaller total lung volumes, their tidal volumes will also be smaller than the average male’s. By dividing minute ventilation (in liters) by minute oxygen consumption (also in liters) it will give a value referred to as “ventilation O2.” This is the liters of air breathed each minute that is associated with each liter of oxygen consumed (VO2). Ventilation O2 values are similar for men and women and both, as they work harder, tend to increase the amount of air they breathe for each liter of oxygen consumed. In reality, what elite runners do, when a 2-2 breathing rhythm leaves them craving a little greater minute volume, is to increase breathing rate to a 2-1 or 1-2 rhythm, or some combination thereof that results in 60 breaths per minute (1 respiratory cycle per second) and is a rate that minimizes the drop in tidal volume. For example, 60 breaths per minute with a tidal volume of 2.5 liters results in a VE of 150 liters per minute. 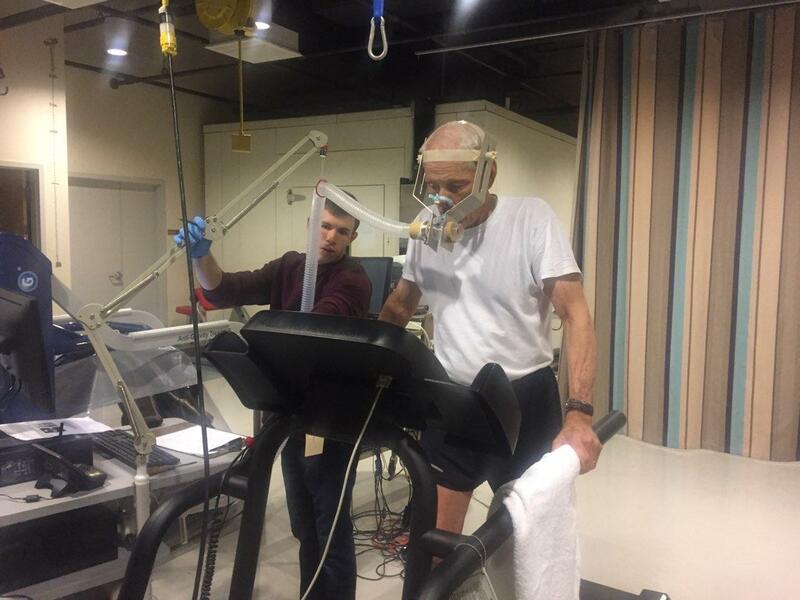 I have measured a minute ventilation of 226 liters per minute in an elite distance runner, but it is important to realize that a greater VE does not mean a better runner – it is not something many runners need to try to improve on. Some runners just feel comfortable breathing harder than do others – each runner has a particular tolerance for the discomfort associated with hard running, and with the build up of carbon dioxide in the lungs, and adjusts breathing as necessary. Sometimes runners will ask whether they should breathe in and out of the mouth or through the nose. Both get air into the lungs and when you are in need of moving a lot of air in and out, use all the openings you can to move the air you need – in and out of both the nose and the mouth is the way to go, but try to do it in as relaxed a manner as possible. Something that can change some of these numbers is running at altitude, where the air is less dense and offers less resistance to flow in and out of the lungs, which allows for a great tidal volume. It is very typical for runners to have an increase in minute ventilation during hard running at altitude that is 20 or 30 liters per minute greater than anything they would move in and out of their lungs at sea level. In fact, it is much more common for altitude runners to breathe with a 2-1 or 1-2 rhythm, and some even use a 1-1 rhythm during hard altitude running. What I have seen to be a pretty common breathing tactic, during demanding races, is a 2-2 rhythm during about the first 2/3 of the race distance, with a shift to 2-1 or 1-2 the final 1/3 of the race. Something that probably should be avoided, however, is starting a race with a 3-3 or slower rhythm, especially if you know you will be moving to a more rapid rate as the race progresses. It is more desirable to start with the rhythm you expect to use during most of the race and just increase the depth of breathing as the race becomes more demanding. Sometimes being aware of your breathing rhythm can be useful in fending off or eliminating a side “stitch.” More rapid breathing seems to aggravate stitches, and going to a slower, deeper rhythm can sometimes get rid of a stitch. Slower, deeper breathing may not be an option if in a high-intensity race, but it often is an option in long training runs, or in a marathon race. I often suggest to runners, who are not used to training at altitude, that they let their breathing rhythm help them determine how hard to be running under the stress of altitude. If you know you can handle a good interval session at sea level, while breathing 2-2 the whole time, then keep a 2-2 rhythm at altitude (or maybe 2-1, as described earlier), and if you can’t, that is a good indication that you may be trying to go too fast for the altitude conditions. Breathing stress is probably what many runners subconsciously use as a guide in non-timed work bouts, when they are running by “feel” rather than distances for time. "The Craziest Part Is That I Still Had Extra Left In The Tank"